Market news affects volatility. Keeping an eye on big economic announcements like interest-rate changes, legislative updates or geopolitical news allows you to be aware when volatility is likely to increase. Individual company earnings reports can cause spikes in volatility as well, particularly with those that are well known and tracked by analysts and the media. 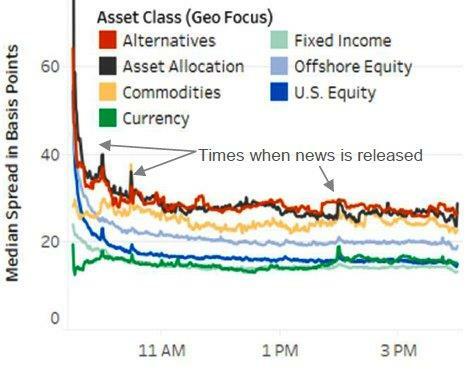 Research has shown that ETFs can see spreads spike at 10 a.m., 10:30 a.m. and 2 p.m., which are popular times for the release of economic news. Underlying markets typically move on the news, spiking volatility (see Exhibit 1). Note: Median spread is calculated by taking the median bid/ask spread in all U.S.-listed ETFs within an asset class in one trading day. One percentage point equals 100 basis points. I covered limit orders vs. market orders in a previous post (read: Get the right price), but using limit orders becomes particularly important during periods of market volatility. While there is a place for market orders in ETF trading – if your highest priority is completing the trade as quickly as possible – during volatile times, it is generally advisable to place a limit order so you can control the price you pay should markets swing while your trade is executed. When in doubt, help is available. Our ETF Capital Markets team is immersed in the world of ETF trading in Canada and focused on helping you achieve the best trading results possible. We work directly with different market makers and these relationships allow us to support you and your specific trading needs. We are available to advisors for trading and liquidity guidance, pre-trade questions and execution assistance. To get in touch with our ETF Capital Markets team, please contact your PowerShares Sales rep at 1.800.261.8689 or e-mail us at capitalmarkets@powershares.ca. This is the third and final blog post looking at ETF trading best practices. In case you missed them, read Get the best price and Watch the clock. If you have any questions, please feel free to leave them in comments below. This document is for informational purposes only and does not constitute a recommendation of any investment strategy or product for a particular investor. Investors should consult a financial advisor/financial consultant before making any investment decisions.